REV'IT! Voltiac Jacket: Your Attention Please! CALLING ALL MANIACS ON THE ROAD! GET OFF OF YOUR CELL PHONES! …… STOP SHAVING IN TRAFFIC! …...PUT DOWN ‘FIFTY SHADES OF GREY’ AND WATCH THE ROAD! 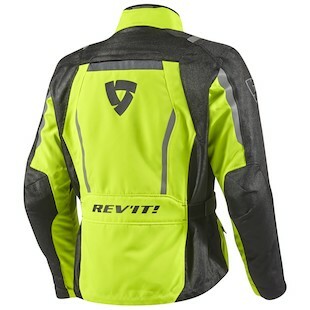 Riding motorcycles is dangerous (my mother would agree), which is why Rev’It has introduced the Voltiac HV jacket. This jacket addresses key areas of concern for the average commuter / consumer. The REV'IT! Voltiac Jacket IS the Sand 2 without the creature comforts. The important features, such as hydratex waterproofing, removable thermal properties, and upgraded KNOX CE armor, are included. The Voltiac sacrifices some adjustability and the extra $200 price tag. However, Rev’It didn’t sacrifice $200 in features. This jacket is a great option for serious riders on a budget, looking to spend their leftover money on tires, fuel, or more gear. By adding a ton of features, at a more than reasonable price, Rev’It has increased the Voltiac’s market share. Now, more riders will be able to afford to ride in high quality gear. Another important area of concern is style. You can’t ride a motorcycle without a stylish jacket….it’s an unwritten rule. The challenge comes when trying to make Hi-Viz stylish. Rev’It nailed it! The ratio of Hi-Viz to Black is perfect. In addition, the Black does an excellent job breaking up the Hi-Viz, making it easier to be seen by multitasking motorists. The reflectivity accents the clean lines of the jacket, while allowing the jacket to be seen from space. 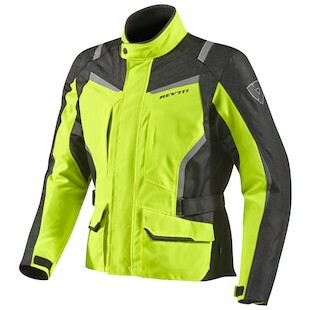 The reflectivity is strategically placed around the jacket, to create the impression of a persons silhouette, making it easier for maniac multitasking motorists to recognize the rider. The Rev’It Voltiac is a great value, plain and simple. However, it doesn’t belong in the “bargain bin”. This jacket belongs on the top shelf, hanging next to the rest of Rev’It’s high quality gear. If you’re looking to plan for next riding season and appreciate Hi-Viz like me (or even half as much as me), the Voltiac deserves your consideration.